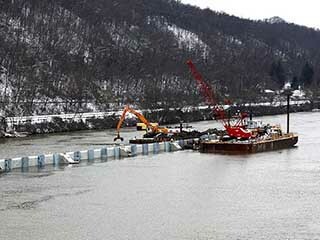 Work on this project consists of construction of the Upper and Lower Approach Walls at Charleroi Lock and Dam on the Monongahela River. 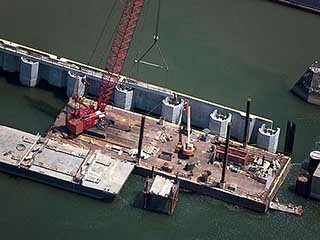 The Upper Guard Wall consists of precast concrete pier cap beams, precast box beams sections, and a concrete-filled steel sheet pile nose cell. 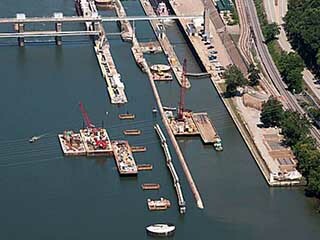 Each pier consists of two 66” diameter concrete reinforced drilled shafts, a 10′ x 8′ – 10” x 30′ precast cap beam with a cast-in-place thrust block which is placed partially underwater, and a 10′ x 10′ x 111′ precast concrete Approach Wall beam. 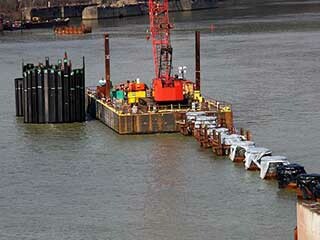 The Upper Guard Wall also includes a sheet pile cut-off wall driven underwater. The Lower Guard Wall consists of drilled shafts, precast shells over the drilled shafts, precast wall panels, a precast cap beam, infill concrete, a sheet pile cut-off wall, and four flow diversion cells. There are thirteen 9′-6” diameter concrete reinforced drilled shafts. Each drilled shaft is encased with a reinforced precast concrete enclosure. Precast wall panels are attached to the shaft of the wall; with cap beam is filled with concrete. 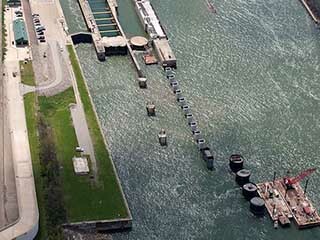 At the downstream end of the wall is a nose pier consisting of a steel shell placed over two of the drilled shafts and filled with concrete. 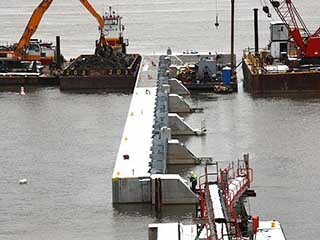 The flow diversion cells are 30′ diameter gravel filled and concrete capped sheet pile cells that are installed riverward of the nose pier.